We work to conserve the natural ecosystems of the peninsula. We protect habitats that are home to many species to ensure their presence. We seek to maintain the successful functioning of ecological processes. We have presence in northwestern Mexico and our conservation efforts are concentrated in the Mediterranean region, which includes the western coastal area of ​​Baja California, from the US border to El Rosario, approximately 217 miles south of Tijuana. This region is one of five in the world and the only one in Mexico. The characteristics of the region allow the presence of endemic flora and fauna species, that is, they are only found in that area. That is why the Mediterranean region is a unique site and one of main interest for conservation at a national and international level. 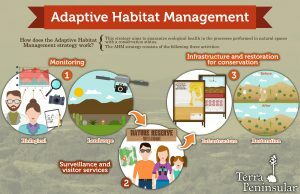 This conservation strategy is responsible for identifying and defining priority conservation sites. It also finds and applies the management tools that best suit their characteristics to ensure that conservation efforts are permanent. 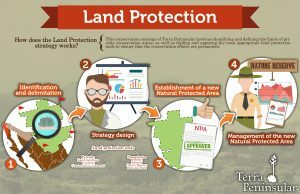 This strategy seeks to ensure that the ecological processes within the natural areas that are already being protected stay healthy. In order to do this, we perform biological and landscape monitoring surveillance programs, infrastructure and restoration activities, and we take care of the visitors that come to the reserves. 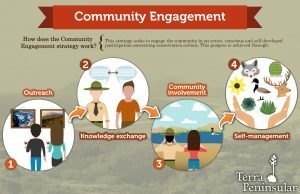 This strategy seeks to achieve and active, conscious and autonomous participation of the community in conservation activities.